GOVERNMENT: Independence from France, 1960. President elected by universal suffrage. Governing bodies: Assemblée Nationale, elected by universal suffrage, and Senate, elected by regional and municipal delegates. Gabon is a heavily forested country that straddles the equator on Africa’s Atlantic Coast. Its abundance of natural resources, particularly oil, has made it one of the most prosperous countries in sub-Saharan Africa. The rain forests and rivers that dominate Gabon’s landscape have heavily influenced the country’s social and economic development. Before the discovery of oil, forest products were the source of Gabon’s wealth. Because of the difficulty of traveling through the dense forests, goods were transported by boat along the rivers. The coastal plain and much of Gabon’s interior are relatively flat, but mountains rise up in both the northwest and south-central regions. Dense tropical rain forest covers three quarters of the country. A number of rivers—including the Ogooué, the largest—flow through the forest. The Ogooué served as the country’s main transportation route until a railroad was built in the 1970s. Over half of Gabon’s population lives along the coast, in the capital of Libreville and the city of Port-Gentil. In the past, many rural inhabitants lived near rivers running through the forest. Today, governmentbuilt roads lead to most inland villages. The population of Gabon is made up of a number of Bantuspeaking peoples with similar cultures and beliefs. The traditional social structure was based on family compounds. Each compound consisted of a male leader and his extended family, as well as friends, slaves, and dependents. Widespread ancestor worship strengthened family ties. The family compounds were grouped in villages, which in turn might belong to districts made up of several villages. Bonds based on trade, marriage, mutual defense, and shared rituals helped to unite the districts. During the early colonial period, timber and rubber were the most important products of Gabon’s economy. In the 1920s and 1930s, cocoa and coffee were introduced as cash crops in northern Gabon. Since the country became independent in 1960, oil has dominated the economy. Today, largely because of oil, Gabon’s per person income is among the highest in sub-Saharan Africa. However, for the most part, the benefits of the oil boom have been limited to a small group of citizens. Gabon’s other major exports are timber, manganese, and uranium. No major kingdoms existed in Gabon prior to the colonial era. The first Europeans to visit the region made trade arrangements with coastal groups who acted as go-betweens with peoples of the interior. Coastal traders carried European products and salt inland. Dealing with village leaders in the rain forest, they exchanged the European goods for slaves and ivory to be shipped abroad. Several European powers sought to control Gabon, but the French were the first to establish a permanent base. In 1843 they set up a naval station at Libreville and, over the next 50 years, explored the country. Real control of the area came only with the expeditions of Pierre Savorgnan de Brazza, who explored the Ogooué River and beyond between 1874 and 1883. In the 1890s Brazza convinced local chiefs to sign treaties that the French used as the basis for taking over the region. The French government gave several companies exclusive rights to exploit Gabon’s timber and rubber in exchange for building roads and improving the land. But poor management, high operating expenses, and the collapse of the rubber market led to the failure of most of these ventures. The economy improved with the introduction of coffee and cocoa farming in the early 1900s. However, in the 1920s educated Gabonese began to call for more political rights and a change in French policies. After World War II, France allowed Gabonese to hold seats in both the French National Assembly and the Gabonese Territorial Assembly. 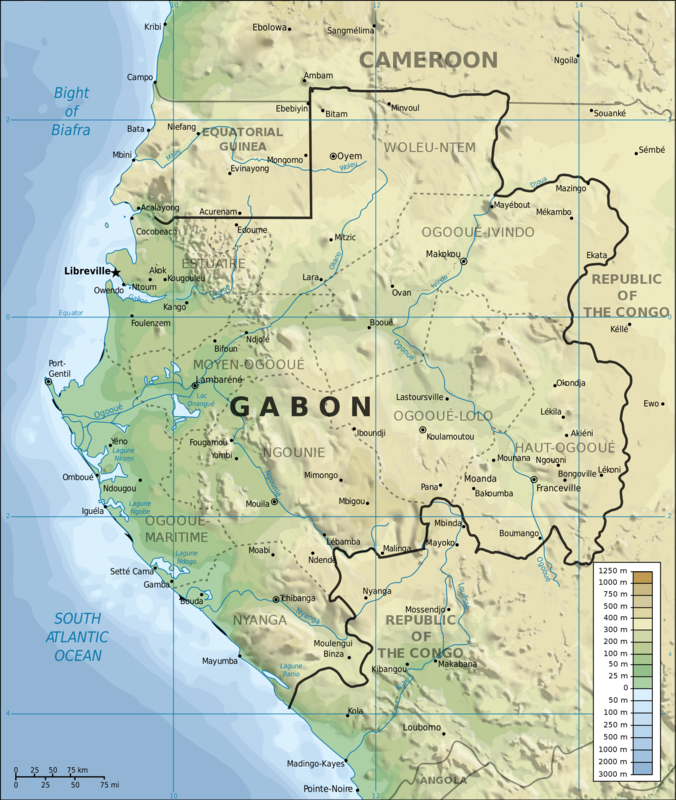 In 1960 Gabon gained independence. The first ruler of the newly independent nation was prime minister Léon Mba. He quickly moved to make Gabon a single-party state. By 1964 opposition to Mba’s rule led to a coup, but the French sent troops to Gabon to restore Mba to power. Mba chose his own successor, Albert-Bernard Bongo, who took over after Mba’s death in 1967.